Monthly Inserts or Newsletters on Stewardship! Consistent, well–written, on–going education and communication about stewardship. Any of our monthly inserts will transform the hearts of your members into gracious stewards! Perfect for your bulletin, newsletter or in the pew. They can also be used for bible study groups, as a tool for stewardship programs, in statements, as well as for outreach activities. They are available in printed or digital formats for easy customization, email or web use! The Stewardship Toolkit provides a robust set of essential resources to help christians grow in their involvement, commitment and generosity every month! These resources serve as wonderful reminders of why each of us needs to give back to our church, sharing God’s grace. As God has given us a “lease” on life, we need to reinforce our Christ–centered life by giving back rather than being self–focused. Use them to stimulate a better understanding of true giving of one’s time, talents and abilities, as well as financial resources! The modest cost will repay your investment many times over! Click thumbnail image for more information on each insert! Stewardship is a 4–page, full–color insert with a lively mix of articles, anecdotes, games, poems, cartoons and prayers that inspire even the most skeptical would–be stewards. It is the #1 monthly publication about stewardship and has been used successfully by thousands of churches for more than 40 years. Churches use it primarily as an insert in the bulletin or monthly newsletter. Stewardship is available in both English and Spanish and you may place combined orders. As part of your subscription, you will receive “A Stewardship Minute,” (downloadable each month at the Parish Resource Center) which supplements the Stewardship newsletter. It can be read by the pastor, stewardship leader or lay reader during worship to briefly introduce and remind the congregation about the principles of stewardship each month. “A Stewardship Minute” includes a free link for your website so everyone can read it easily! Copies of Stewardship are shipped flat (8¼" x 10 ¾") although time–saving folding options are available. You may order copies tri–folded (to fit in a std #10 envelope) or half–folded (8 ¼" x 5 3/8"). The charge for folding is $1.50 per 100 copies, with a minimum charge of $1.50. Folding is FREE for orders over 1,000 copies. 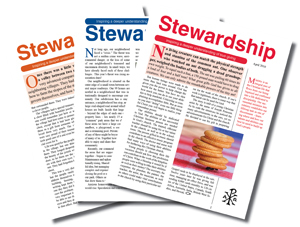 You may purchase Stewardship in either printed or downloadable formats. If you send your newsletter via email, but still want printed copies for Sunday, you can combine the order to include both formats! Both editions include the lay–reader message “A Stewardship Minute,” as well as a free link to it for your website. Printed editon: The printed edition provides four pages of color print at a cost that is less expensive than most churches can print it themselves. You will receive the issues via USPS or UPS approximately 3 weeks prior to the monthly issue date. New orders typically ship within 48 hours of receipt of the order. Shipping cost surcharge applies to AK, HI, PR and Canada. Downloadable editon: The downloadable edition is perfect for distributing to members via email or your website, or copying/pasting all or part in church publications. This saves on the cost of paper, shipping/handling and the church’s mailing costs. A downloadable subscription includes both the English and Spanish editions for the same price! It also includes a free link to either edition for your website so your members can get it instantly and you don’t have to upload it each month! Consistent, well–written, on–going education and communication about stewardship in Spanish. Stewardship, the #1 monthly insert about stewardship, is available in Spanish ... called “Co–Responsabilidad.” It is the same wonderful reminder of why each of us needs to give back to our parish. As God has given us a “lease” to life, we need to reinforce our Christ-centered life by giving back to our church and its members rather than being self-focused. It is a wonderful reminder of why each of us needs to give back to our church, sharing God's grace. As God has given us a “lease” on life, we need to reinforce our Christ-centered life by giving back rather than being self-focused. Use Co-Responsabilidad to stimulate a better understanding of true giving of one’s time, talents and abilities, as well as financial resources! The modest cost will repay your investment many times over. We recommend that enough copies be ordered so that each person or family will receive a copy. Co-Responsabilidad will inspire an enhanced spiritual basis of giving ... each and every month. Copies of Stewardship are shipped flat (8¼;" x 10 ¾") although time-saving folding options are available. You may order copies tri-folded (to fit in a std #10 envelope) or half-folded (4 1/8" x 5 3/8"). You may purchase Co–Responsabilidad in either printed or downloadable formats. If you send your newsletter via email, but still want printed copies for Sunday, you can combine the order to include both formats! Printed edition: The printed edition provides four pages of color print at a cost that is less expensive than most churches can print it themselves. You will receive the issues via USPS or UPS approximately 3 weeks prior to the monthly issue date. New orders typically ship within 48 hours of receipt of the order. Shipping cost surcharge applies to AK, HI, PR and Canada. Downloadable edit on: The downloadable edition is perfect for distributing to members via email or your website, or copying/pasting all or part in church publications. This saves on the cost of paper, shipping/handling and the church’s mailing costs. A downloadable subscription includes both English and Spanish editions for the same price! It also includes a free link for your website to either edition so your members can get it instantly and you don’t have to upload it each month! Graceful Generosity is a 2–page (front/back), insert that focuses on the biblical principles of why we need to share God’s grace. It is a quick read and will provide everyone in the congregation with food for thought each month. 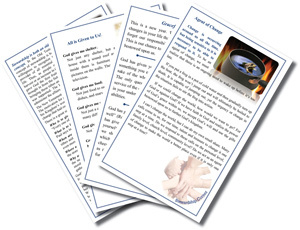 As part of your monthly subscription, you will also receive “Gracious Givers,” our lay reader series, which supplements the Graceful Generosity insert. It can be read by a stewardship leader or lay reader during worship to briefly introduce and remind the congregation about the principles of stewardship each month. A subscription includes a free link to Graceful Generosity for your website, so your members can get it instantly and you don’t have to upload it each month! 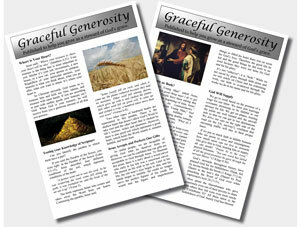 Graceful Generosity is available in printed or downloadable format. Please note that the printed edition is printed in black and white; the downloadable edition is in color. The downloadable edition is perfect for distributing to members via email or your website, or copying/pasting all or part in church publications. This saves on the cost of paper, shipping/handling and the church’s mailing costs. Sharing God’s Bounty is a 1–page color insert that focuses on the biblical foundations that compel us to be generous with all that God has given us, evenly discussing time, talent and treasure. There are English- and Spanish-language editions ... and both are included in a subscription at no extra charge. It is a quick read and will provide everyone with food for thought each month. As part of your subscription, you will also receive a monthly lay–reader message that accompanies Sharing God’s Bounty, which can be read by a stewardship leader or lay reader during worship to briefly introduce and remind the congregation about the principles of stewardship each month. Also, included is a high resolution theme image for the month. 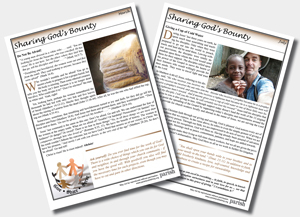 Sharing God’s Bounty is available in downloadable format only. It is perfect for distributing to members via email or your website, or copying/pasting all or part in church publications. This saves on the cost of paper, shipping/handling and the church’s mailing costs. The full–color insert in PDF format. Both English and Spanish versions are included. The full text of the insert in MS Word format for easy copying/pasting. Both English and Spanish versions are included. The accompanying lay–reader message in both PDF and MS Word formats (English only). A co–ordinated theme image to enhance other publications. Plus, a link for your website so your members can get it instantly and you don’t have to upload it each month! 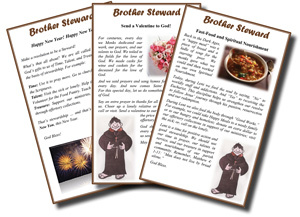 Brother Steward is a fun and lively bi–weekly (every other week) bulletin insert that makes stewardship come alive ... inspiring the foundations of strong stewardship. There are English– and Spanish–language editions and both are included in a subscription at no extra charge. Brother Steward is a major personality and will provide everyone with food for thought every other week. Several months of the year include an alternate Brother Steward insert for special occasions. As part of your subscription, you will also receive a monthly lay–reader message that accompanies Brother Steward, which can be read by a stewardship leader or lay reader during worship to briefly remind parishioners about the principles of stewardship each month, as well as a link for your website so your members can get it instantly and you don’t have to upload it every other week! Brother Steward is available in downloadable format only. It is designed as 5.5” x 8.5,” but can be scaled to any size. It is perfect for including in your bulletin or newsletter, or distributing to members via email or your website, or copying/pasting all or part in other church publications. This saves on the cost of paper, shipping/handling and the church’s mailing costs. Two (every other week) different full–color inserts in PDF format for easy printing, as well as MS Word format for easy copying/pasting or re–sizing. Four months during the year include a third, alternate insert for special occasions. Both English and Spanish versions are included. Plus, a link for your website so your members can get it instantly and you don’t have to upload it every other week! The Stewardship Corner provides a poignant, but lighter message every week. It builds a strong foundation of stewardship consistently without being over–bearing. Subscriptions include both the English– and Spanish–language editions at no extra charge. As part of your subscription, you will also receive a link for your website so your members can get it instantly and you don’t have to upload it every other week! The Stewardship Corner is available in downloadable format only. It is designed as 5.5” x 8.5”, but includes an MS Word file so you can alter the size and layout, if desired. It is perfect for including in your bulletin ir newsletter, or distributing to members via email or your website, or copying/pasting all or part in other church publications. This saves on the cost of paper, shipping/handling and the church’s mailing costs. Four full–color inserts (every week, except months with five Sundays) in PDF format for easy printing, as well as MS Word format for easy copying/pasting or re–sizing. Both English and Spanish versions are included at no extra cost. New format with even more resources! An essential part of the stewardship ministry of every church is to provide on-going education and communication about sharing God’s grace. Year-round education uses every opportunity to teach the principles and practices of the stewardship life. Make life easy for your stewardship committee! The Stewardship Toolkit does just that ... It provides all of the essential materials every month! Christian stewardship doesn’t happen automatically; it happens by design. Through a year–round emphasis, church members will grow in their understanding of stewardship, thus becoming more involved, committed, and generous. This transformation of the heart will lead members to live out their stewardship of God’s grace every day, sharing their time, talent and treasure. The Stewardship Toolkit consists of all the communication and education resources you will need each month (hover your mouse over the items in the table below for more information). The materials are downloadable before each month at our Parish Resource Center. Most of these resources can be used as is, but they can easily be customized to add the church logo, or edit for local references. You have the option to complete the yearly communication plan by adding one of our five monthly inserts at substantial savings on a combined subscription. Here is what you get each month! Letters for 10 occasions during the year! Click here for a sample and to view what you get during the year! At the beginning of each month, you will receive the upcoming month’s material (See the Annual Plan to see what is included each month) at the Parish Resource Center. Everything in the The Stewardship Toolkit is downloadable in both Microsoft Word or PDF format and may either be edited and customized, or printed and used “as is” with no changes ... it is up to you! Add the church logo if you like, or edit them to add desired local references! You may choose to include one of our inserts for your bulletin or newsletter. If you choose to include an insert in printed format, they will be mailed to you in the beginning of the month (almost a month before you will use them!). Generous Reflections bulletin/website messages and mid-week eStewardship email articles may simply be copied and pasted into your publications. 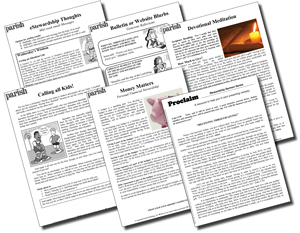 Youth Stewardship, Devotional Meditations and "Money Matters" and Bible Studies are handouts formatted to be printed with no customization needed, although you can edit or add the church logo if desired. Stewardship Sermons and Letters from the Pastor can be used "as is" or edited, as desired. In addition, any of our inserts can simply be included in the bulletin or newsletter each month. Combined orders include a substantial discount. To compare the cost of any insert: click here.